We are having so much fun! Our week pass to Zion National Park expired yesterday, so today we decided to let our Jeep enjoy what a Jeep is made to do! 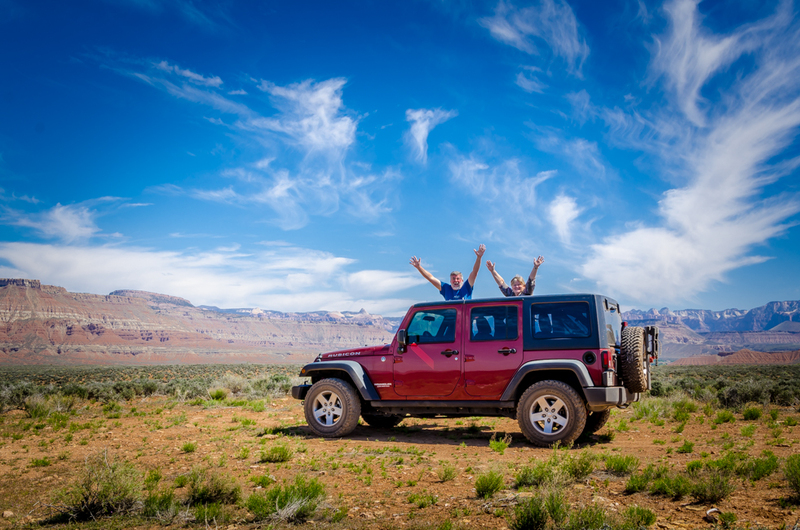 We asked for some recommendations for 4-wheel drive roads and had fun driving all over enjoying the Jeep. It was a blast! Southern Utah is beautiful and it was wonderful to drive around in the middle of nowhere enjoying the sites. Charlene put on a classical channel on Sirius radio and we had a wonderful time. Several times the roads were crisscrossed by mountain bike paths and bike riders were going everywhere. We also found several RVs on a couple of the smooth back-roads enjoying some boon docking locations. This is a very nice area to visit. We must come back and spend more time here. After the 4-wheel driving, we headed back to the coach to watch the Final Four basketball games. We love March Madness (even though it is now April). We are rooting for the underdogs!